then used that film to create the silkscreen stencil, and hand-printed a limited edition of only twenty-five prints on these super-luxurious organic cotton tees. 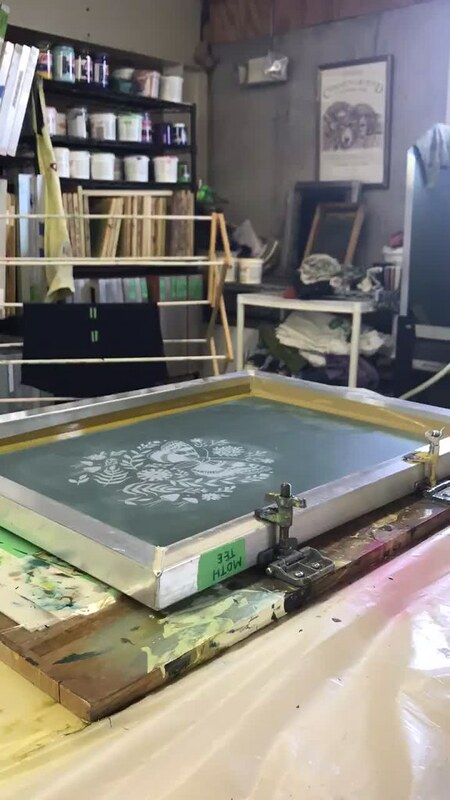 Here's a fun time-lapse video of the set-up process, mixing and testing the ink color, marking out the t-shirts to make sure the print will be neatly centered, etc... Silkscreen printing takes a lot of careful set-up work! And here's a time-lapse of me printing the tees! It's a really flattering scoop-neck style with beautiful, simple details, well-constructed from unbelievably soft Pima cotton. Because it's a different (and fancier) style of tee than I usually print on, I only made twenty-five of these for the Fall 2018 season, and will not be printing more this season, so they'll probably be selling out by the end of Common Ground Fair, if not sooner - if you want to catch one in your size, they are all up on the website now.